veilside body kit for 350z!! Miami Craigslist ad which I just saw today (Monday Nov 5, 2012). Only $550 for the entire kit...looks sweet! Not sure but I think these pics are examples of Velside kits already installed and painted. In the above ad the seller says the kit has never been installed nor painted. Last edited by rudyallan; 11-06-2012 at 01:24 AM. Veilside version 3 kit. a lot of boot legs of this kit are floating around. i had a real one ordered from Japan in 2004. Last edited by TwilightZ; 11-05-2012 at 11:36 PM. Yea, making inferior copies of kits and panels is one of the true negatives for good kit companies and good tuning shops. 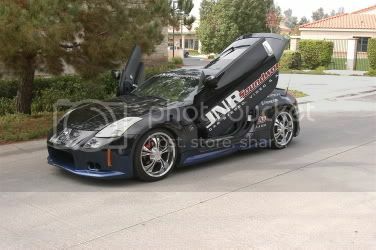 Its odd that he didn't put it on his 350z when he bought it. He prob bought a few from a bootleg shop and is trying to turn them individually for profit. The real giveaway is the fact that he doesn't even show a pic of the actual kit...just pretty pics from shows.